Race Deck TuffSheild Diamond Pattern 12" x 12" x 1/2" | TuffSheild High Gloss Finish, Diamond Pattern Interlocking Garage Floor Tiles. **Due to shipping cost we require a minimum order of $ 50 (any color combination) to receive free ground shipping. Our patented TuffShield technology delivers a high-gloss finish that is engineered to withstand the harsh garage environment. This easy to clean surface is resistant to petroleum products and most household chemicals. 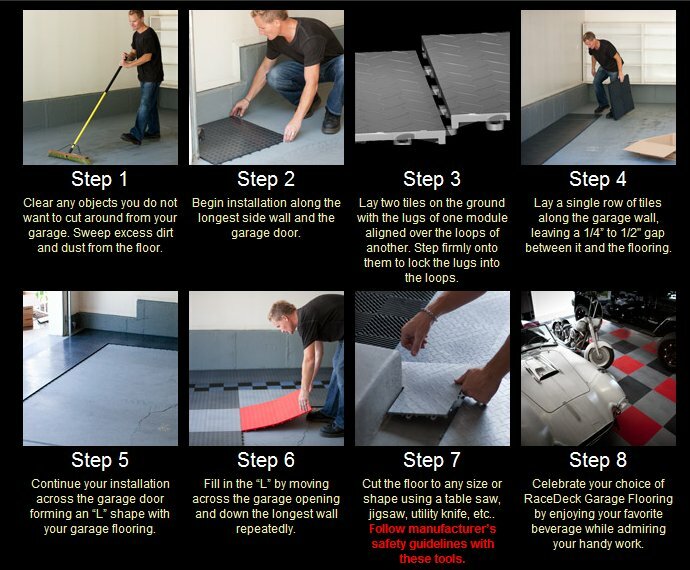 The patented RaceDeck Diamond is the one that started the modular garage flooring industry you see today, and continues to be the best selling garage flooring system on the planet. Engineered to not only withstand the tough garage environment but also deliver you “the coolest garage on the block”™. Race Deck Pro Tile Diamond Pattern 12" x 12"